Driving out of the way to upload recorded video at headquarters is expensive and a productivity killer for patrol officers. The 4RE® in-car video system can keep them on the road with automatic, direct uploads to WatchGuard’s cloud-based or on-premise evidence management system via cellular networks like LTE and FirstNet, anytime, anywhere. When you look at the time savings alone, it’s astronomical. Watch how Arkansas Highway Police takes advantage of WatchGuard’s 4RE in-car video and FirstNet cellular-upload technology to save time and money while capturing video evidence. The WatchGuard 4RE can be configured to automatically upload recorded events from the in-car system and integrated VISTA body-worn camera via a variety of wireless networks anywhere the officer may be, and anytime throughout the shift. A perfect solution for agencies with a take-home car policy. Upload recorded events directly to WatchGuard’s cloud-based or on-premise evidence management system for storing, viewing, and sharing. Either way, your evidence gets to where you need it. Configure the 4RE to automatically prioritize the uploading of critical (court-bound) incidents ahead of routine, non-critical recordings. Quickly put evidence in the hands of people who need it the most. Is Your Agency a Good Candidate for Cellular Upload of Video? 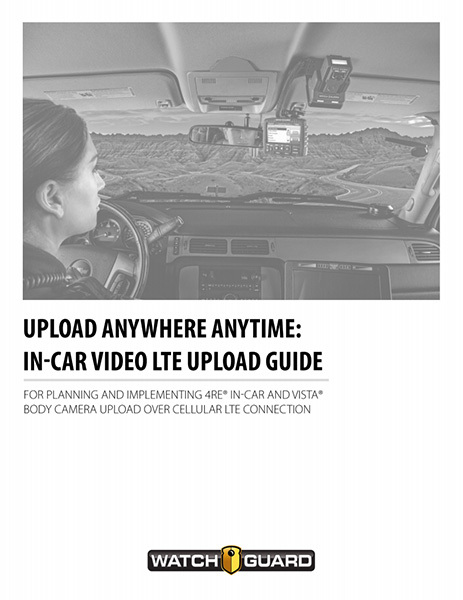 Check out our free guide for planning and implementing video uploads over a cellular LTE connection. Plus, discover configuration options using mobile gateways or MDC devices.